Annisa is also wearing a fabulous print dress, this time in an Aztec-type pattern. The turquoise blue tone is a summer-style staple and is quite flattering to almost any skin tone. A dress or two like this should be in every smart gals summer wardrobe! With the empire-waist style that flows very flatteringly from under the bust, this is a sure bet to keep you feeling cool and breezy on those scorching days ahead. The classic empire-waist style is also a great fit for lots of figures, as it brings the focus to the bustline and away from potential problem areas. 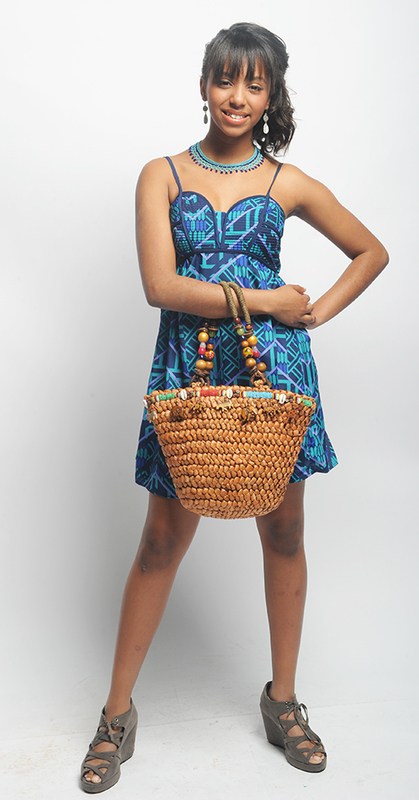 We went ahead and added some fun summer accessories like the silver dangle earrings, hand beaded necklace in two tones of blue, and of course, the piece de resistance, the totally cool vintage straw handbag. When it came to footwear, we chose to go with Annisa’s own grey suede wedge heeled gladiator-style shoes to add a little height and protect her feet from the hot pavement on a day filled with summer shopping! Remember, a colorful sundress can, and will, help to keep you looking and feeling cool this summer in all the right ways, just like Annisa! 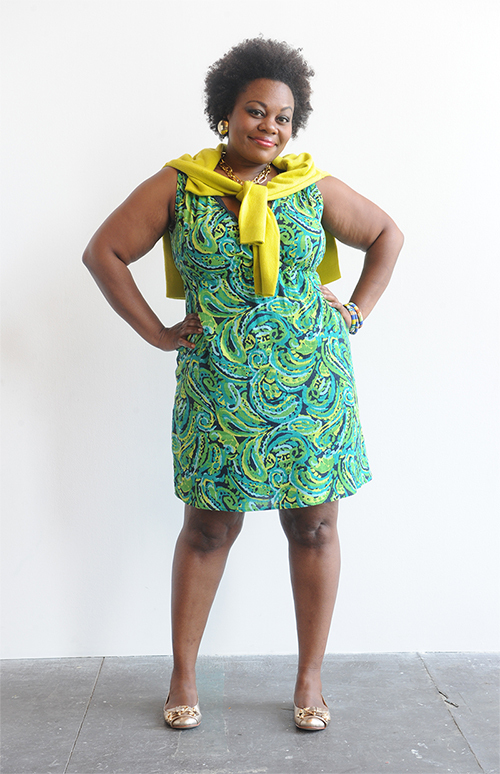 Damara looks ready for the bright days and cooler nights of summer in this colorful ensemble. Just like last month, where our focus was on dresses, we started with a teal-green and navy- paisley print dress from Merona. This is a great little summer sundress for sure, but we weren’t finished adding some more fashion flourishes quite yet. During the day Damara could casually tie the chartreuse lightweight acrylic sweater from Forever 21 over her shoulders. But, when the evening chill descends why not layer it over the dress and add a breezy bohemian scarf in black, purple and grey? The darker color of the scarf is a nice contrast with the brighter tones, and is a sophisticated choice. Since this look is casually cool, we used Damara’s own gold metallic flats to keep it relaxed and not too dressy. The gold metallic earrings,color blocked bangle bracelet and gold chain necklace add a little sparkle and shine, that bring out the beauty of our model, who looks like she’s ready to take on whatever adventures this summer may bring!